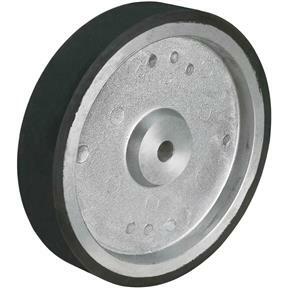 This 10" Aluminum/Rubber Wheel is an optional larger diameter replacement wheel for the G1015 Knife Belt Sander. 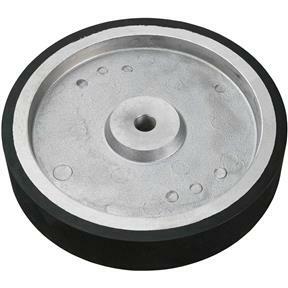 This larger wheel allows you to grind larger items without interference from the grinder body. I looked for a while for a 10 to 12 inch contact wheel for my knife grinder and could not find one that ships to me for any reasonable price (like under $200.00). I bought the Grizzly ad it works great. runs true and no vibration. I had to machine the bore to accept bearings but a different grinder set up may not need that. It just comes with a drilled 5/8" hole through the center. P.S. don't take the 5/8" as a for sure dimension. I am going by memory which is lacking, but I'm pretty sure the Grizzly site has the info on it. This 10inch wheel is a must. If you are making knives it gives you needed clearance from the motor. Its to bad it doesn't come that way from the manufacturer. ? This wheel is just exactly what I was looking for, it is well made and I expect it will last and last. The shipping was fast and it was packaged well. I have done business with Grizzly prior to this order, and they continue to offer excellent service. There is no doubt I will do business with them in the future.